REGIONAL METAMORPHISM OCCURS WHEN A LARGE AREA OF ROCKS ARE EXPOSED TO INTENSE PRESSURE. This pressure causes the minerals inside the rocks to shift and realign, smashing them closer together. THIS OCCURS MOST OFTEN DURING MOUNTAIN BUILDING EVENTS, SO METAMORPHIC ROCKS ARE OFTEN FOUND NEAR MOUNTAIN RANGES. he pressure on the rocks sometimes forces the minerals into parallel layers. The new metamorphic rock splits easily along these layers. 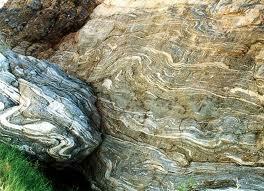 When metamorphic rocks break along layers of parallel minerals they have a property called foliation. 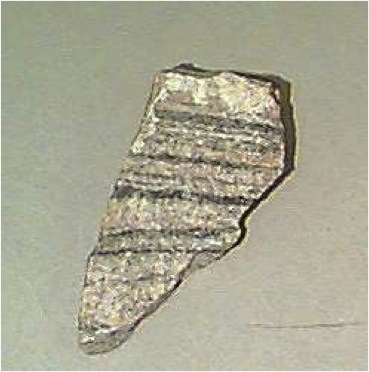 FOLIATION IS A PROPERTY OF METAMORPHIC ROCKS THAT HAVE PARALLEL WAVY LAYERS. BANDING IS A PROPERTY OF METAMORPHIC ROCKS THAT HAVE WAVY LAYERS THAT ALTERNATE BETWEEN LIGHT AND DARK COLORS. CONTACT METAMORPHISM OCCURS WHEN HOT MAGMA FORCES ITS WAY UP INTO THE CRUST. WHEN THIS HAPPENS THE HEAT COOKS THE ROCKS NEARBY CAUSING METAMORPHISM. Eventually the magma will cool and become a layer of igneous rock that cuts into the rocks around it. This is called an igneous intrusion. Contact metamorphism rarely reaches more than 100m from the igneous intrusion. Most regents questions about metamorphic rocks will ask you to determine which type of metamorphic rocks will form in an area based on rock outcrop diagrams like the one below. In these outcrop diagrams contact metamorphism is shown as little dash lines that stick out from the igneous intrusion. In the diagram above the intrusion is labeled 3 and the key tells us it is basalt. Our job will be to use the ESRT to figure out which metamorphic rocks will be found in each area touched by the contact metamorphism lines. So lets look at the ESRT Metamorphic Rock Table. The two most important columns in this table are highlighted for you. The ROCK NAME column tells you the name of the metamorphic rock (obviously). The COMMENTS column tells us the type of rock that was changed into a metamorphic rock. For example if we look at the metamorphic rock Marble, the comments section tells us it forms from metamorphism of limestone or dolostone. Using the ESRT Sedimentary Rock Chart, we can tell that Layer 4 is Limestone. Using the ESRT MEtamorphic Rock Chart, we can tell that layer Limestone becomes the metamorphic rock Marble. Using the ESRT Sedimentary Rock Chart, we can tell that Layer 2 is Sandstone. Using the ESRT MEtamorphic Rock Chart, we can tell that layer Sandstone becomes the metamorphic rock Quartzite. Using the ESRT Sedimentary Rock Chart, we can tell that Layer 1 is Shale. Using the ESRT MEtamorphic Rock Chart, we can tell that layer Shale becomes the metamorphic rock Slate.